* The top starts with a sweet and slightly spicy mix of plum, cinnamon, and honey. * First whiff had me feeling deja vu. It took me a minute, but I realized it was a fresher version of the Japon Noir opening. * A thick sweetness comes in – like maple syrup and a bit fruity. Although it’s dense, it’s not overly sweet. * From this sweetness peaks out a little bit of sour wood which is the oud showing its presence. It’s not strong or aggressive at all. * The base of vanilla and amber lasts a good long time as a snuggly skin scent. Summary: On a whole, I am unimpressed with the Atelier d’Orient collection because they are not my style/taste. They are more sheer and restrained than you would expect a Tom Ford fragrance to be. 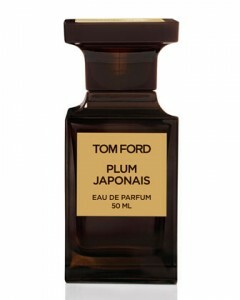 Plum Japonais isn’t bad, and as a candle or room spray it would be pretty amazing. To me, it feels like a lighter version of Japon Noir (which I adore and own a full bottle of). Longevity is average for an EdP at 6-8 hours. If you were a fan of the original Japan Noir and want a lighter version for summer or day wear, this would be a good fit. I agree – Japon Noir is much better. PJ is like an EDC summer version.. Japon Noire au Fraiche..